Today felt like summer. People have been complaining about “June-uary”, and I recently saw a temperature map of the US which shows most of the country at above normal temperatures for this time of year. Except for the upper left hand corner, which has been below normal. Summer has arrived, although the Pacific Northwest season sometimes feels like something other than summer. But today–the air was warm and soft, the woods scented with the flowery fragrance of vanilla leaf, and the occasional sharper green smell of emerging leaves. John carried the chainsaw across the snow patches along the upper part of the Cooper River trail. I was most grateful, as the saw has been my tool lately and I welcomed the opportunity to dig some drain dips and lop brush. We lunched on the rocky terrace above the river, then kept heading downstream. Vine maple leaves are opening from their tightly pleated buds, the perfect solar collectors. “Brush” is a term woods people use to describe all manner of undergrowth. It brings to mind thickets and tangles and impenetrable vegetation. Vine maple may be our local epitome of brush. Cut one stem and three stems grow back. Cut it this year, and by next year it has grown two feet. To travel off trail through dense stands of it leads to bruised shins. It has its redeeming features–flaming yellow and scarlet in the fall, creating perches and homes for birds and other critters, and its wood makes the best sticks for toasting marshmallows over a campfire as well as sticks for water witching. Where vine maple impinges on the trail, we cut and lopped and cast away. There is much more to do. It is a war that is never won, since the plants grow back. But for awhile, for a distance, the trail corridor is clear. Most of my work pictures are snapped on the fly. I’ve taken to keeping the digital camera in my pocket, where I can easily pull it out. 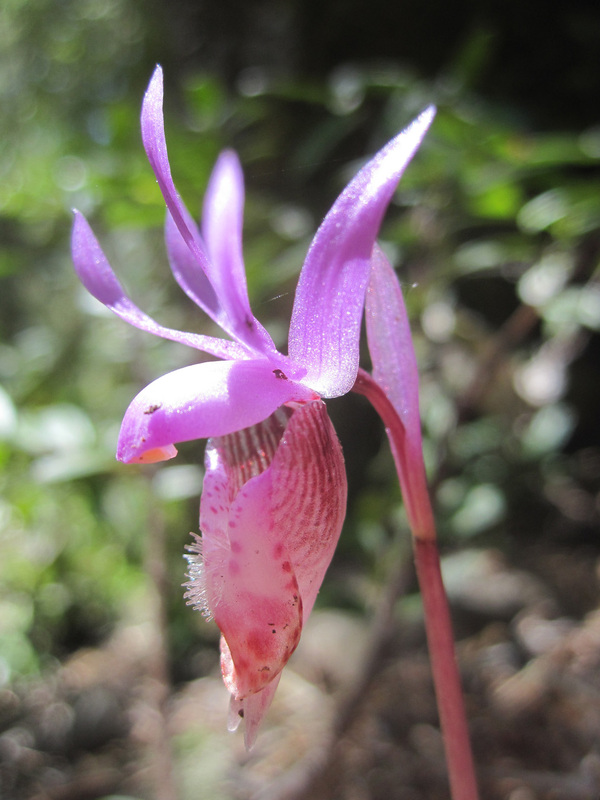 Today’s blog photo is of the fairy slipper orchid (Calypso bulbosa), a deep woods flower that I associate with big old cedars. Orchids are the flamboyant celebrities of the floral realm. These are about six inches high, and the intense pink glows on the forest floor. Needless to say, I just love them, and flopped down on my belly in the trail to get an eye-level view. Notice the fuzz below the lip, and the fine intricate reddish lines leading to the heart of the flower. And the graceful turnings of the upper petals…I snapped three photos, and got up to keep going. It felt like summer. Hiking and working, with senses open to sights and scents and sounds. Feeling sweaty and thirsty, knowing more of that is to come in the next weeks. But mostly enjoying the moment, right now. Ten days till the summer solstice and the longest daylight of the year.